Former Soviet President Mikhail Gorbachev gestures during his news conference ahead of the 20th anniversary of August 19, 1991, hardline coup that tried to oust him and precipitated the collapse of the Soviet Union, in Moscow, Russia, August 17, 2011. 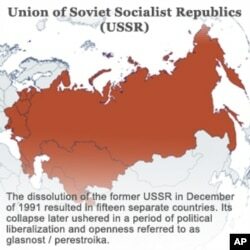 December marks the 20th anniversary of the collapse of the Soviet Union. It was the internal reforms of Mikhail Gorbachev, the last Soviet leader, that contributed to the demise of the Soviet Union. Former National Security Adviser, General Brent Scowcroft, said the Soviet Union previously had a succession of elderly leaders. "So Gorbachev, I think, was brought in to stimulate the system. And exactly how, we didn’t know. And I’m not sure he did,” said Scowcroft. For the next six years, Gorbachev embarked on a series of domestic reforms that radically changed the Soviet Union. Gorbachev’s reforms touched all segments of society. It included freeing press restrictions and releasing political prisoners and dissidents from jail and internal exile. “He was not a democrat, but he was trying to get more efficiency out of the system and reduce the extent of coercion and oppression,” said Scowcroft. One institution Gorbachev failed to reform, however, was the Soviet Communist Party. And it is within its ranks, along with the leadership of the military and the KGB, that hardliners attempted a coup against Gorbachev in August 1991. “It was a pretty inept coup attempt. It was not carefully planned, not carefully carried out,” said Scowcroft. Pickering agrees, saying “It had bankrupt leadership. It was in some ways vodka-soaked, elderly, old think." 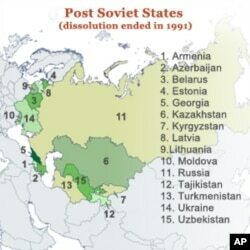 The Soviet Union collapsed four months after the failed coup attempt. And, said Scowcroft, that allowed Boris Yeltsin, Gorbachev’s nemesis, to take Gorbachev head on. “Now how do you eliminate Gorbachev? You pull the Soviet Union right from under him. And I think the end of the Soviet Union, the technical end of it, was in large part because then Gorbachev had no job,” said Scowcroft. Many experts say Gorbachev unleashed forces he ultimately couldn’t contain - forces that inevitably led to the demise of the Soviet Union on December 25, 1991, when Gorbachev resigned as Soviet president.